Born at Montreal, Quebec on 8 September 1862, son of John E. and Mary Buchanan, he was educated at Montreal High School. He commenced a career as a druggist at Montreal in 1878. He came to Winnipeg in August 1882. He was long connected with Winnipeg’s Fire Department, having seen it grow from a small beginning of three fire halls in 1883 to fourteen stations with two hundred and eighty men. He served as Chairman of the Firemen’s Benevolent Association and President of the Western Canada Fire Chiefs’ Association. 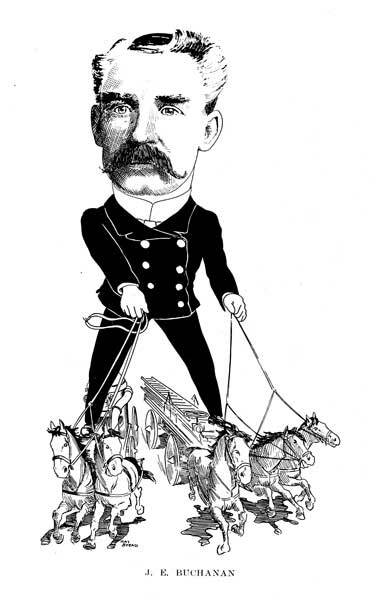 He was Fire Chief from 1899, replacing E. H. Rodgers, until 1928. In 1887, he married Mary Macdonald of Winnipeg, with whom he had one daughter. He was a member of the Masonic Fraternity (Prince Rupert), 32nd Degree, Scottish Rite, a member of the Order of Scottish Clans, IOOF., Commercial Travellers, AOUW, and COF. Long interested in sports, fond of hockey, curling, lacrosse, baseball, motoring. Presbyterian (Knox Church). He died at Winnipeg on 29 January 1938. “Former fire chief is dead,” Winnipeg Free Press, 31 January 1938, page 11.